Former MaGIC CEO Cheryl Yeoh takes wedding planning into her own hands, putting her heart and soul into creating arty touches at her wedding. Cheryl Yeoh and Jason Sew are the couple for whom #weddinggoals would not be out of place on their wedding pictures. Not many brides would go through the trouble of having a hand in the planning and production of their own wedding, preferring to leave it to a professional planner, but not Cheryl Yeoh. The artsy bride and her husband even went as far as crafting wedding bands for each other! Cheryl's meticulously planned wedding truly embodied the real meaning of weddings: not just a celebration of the bond between two individuals, but a union of two families. The couple handmade each other's wedding bands to reflect who they are and what they've created together. The wedding invitations were personally designed with the names written by hand in expressive calligraphy. The circle wedding arch Cheryl designed was made to represent eternity. The Unity Drink, a cocktail of whisky, campari and sweet vermouth, represented their now entwined lives. The thoughtful, personalised note and leather luggage tag along with Cheryl's bridal gown cutlery-tie. The wedding cake toppers were handpainted by Cheryl. The two wedding topper designs matched their real wedding outfits. Cheryl and Jason's first dance, a passionate contemporary number to Ed Sheeran's 'Thinking Out Loud'. Cheryl broke a couple of ribs while practicing the dance due to a move gone awry, but the dedicated bride persevered. The couple flew to LA twice for two five-hour dance bootcamps and Cheryl practiced through the pain. All their effort culminated in a first dance that brought tears of joy to many during their Bali and KL ceremonies. The bridal couple showed their appreciation with thoughtful handwritten notes to each of their 108 guests for their Bali wedding, which came with a stylish and practical gift of leather luggage tags. Plenty of effort went into the wedding invitations, itself. In fact, each guest had a piece of Cheryl's blush tulle wedding gown on their very own tables: As Cheryl's gown was a little too long, she had it altered and the extra tulle was used to tie the cutlery for each guest. Talk about putting your heart into art! From the eternity circle wedding arch design, two hand-painted sets of wooden wedding cake toppers which coordinated with their bridal outfits, to their passionate first dance and Unity Drink idea , you probably couldn't find a more involved and creative bride. Photos courtesy of Cheryl Yeoh and Terralogical. 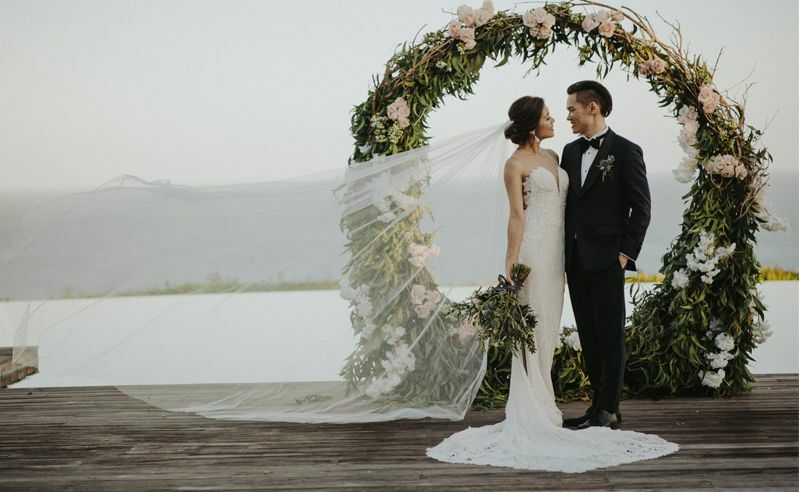 This bride took on her nuptials with confidence: The elegant Angelyn Chong shares her exclusive tips to being a bride.